Mobile analytics firm Mixpanel reports that over 12 percent of iOS devices are now running iOS 9. It’s been 24 hours since Apple dropped the official release of iOS 9, and the adoption rate of this new operating system is a little more than 12 percent, according to Mixpanel, a third-party mobile analytics firm. Utilizing data taken from iOS apps using its SDK, Mixpanel has put together a chart of iOS 9 adoption rates versus iOS 8 and older operating systems, updated hourly. As of 10:00 a.m. Pacific on Thursday—exactly 24 hours after iOS 9 was released—the adoption rate for Apple’s latest version of iOS was 12.54 percent. Meanwhile, 80.23 percent of iOS devices currently run iOS 8, with that figure slowly declining as iOS 9 adoption continues to climb. And according to Mixpanel’s chart, only 7.23 percent of iOS devices are running iOS 7 or earlier versions. Apple has yet to release its own internal figures on iOS 9 adoption. This year’s adoption rate of iOS 9 is slightly lower than last year’s iOS 8 adoption figures. In 2014, CNET reported that in less than 24 hours more than 14 percent of iOS devices had installed iOS 8. Apple’s official figures showed that more than 45 percent of devices had updated to iOS 8 within six days, but that figure went up only one percent in the following two weeks. A year prior, Mixpanel’s chart showed that 15 percent of devices had updated to iOS 7 in less than 12 hours. In retrospect, iOS 7’s drastic shift to flat design was not such a turn off after all, and it will probably remain Apple’s fastest-groining mobile OS. Why it matters: So why do iOS adoption rates keep declining year after year? After the botched launch of iOS 8, users are now more cautious about immediately upgrading to the newest mobile OS. 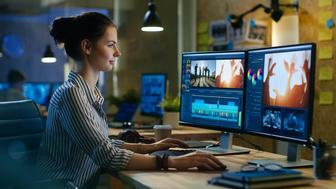 They are giving it some time—a few days—so that Apple may work out any kinks. After users are re-affirmed that the latest version of iOS won’t F-up their devices, the adoption rate could begin to skyrocket. 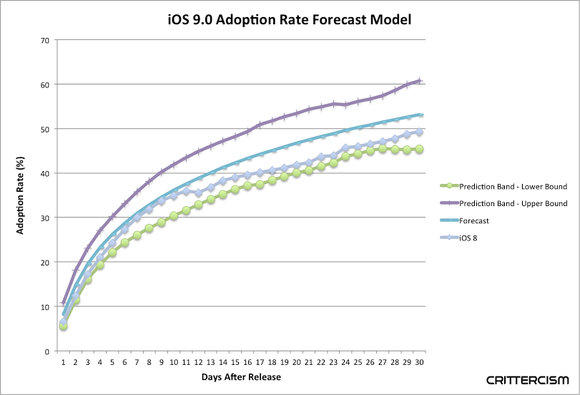 Using current data, mobile app intelligence platform Crittercism created a predictive model for iOS 9’s adoption rate in the coming month. The company is predicting that it will take 25 days for iOS 9 to reach a 50 percent adoption rate, faster than for iOS 8. Crittercism found that this higher uptake could be because iOS 9 has had a relatively successful official launch, reporting a crash rate of 2.77 percent. Last year, iOS 8 had a crash rate of 3.48 percent during the same initial period, according to Crittercism’s figures.